Dish on right contains bacteria spores similar to anthrax. 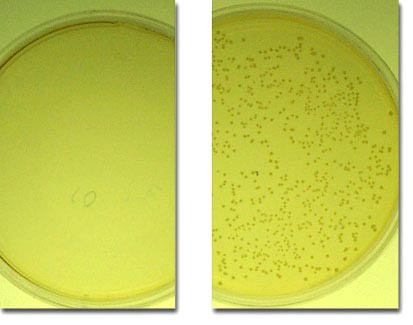 Dish on left shows what happened to spores after treatment with nanoemulsion bio-decontaminant developed by Dr. James Baker and NanoBio Corp, Ann Arbor, Michigan. Photograph courtesy University of Michigan Center for Biological Nanotechnology.